Rho-associated protein kinase (ROCK) is a serine-threonine kinase originally identified as a crucial regulator of actin cytoskeleton. Recent studies have defined new functions of ROCK as a critical component of diverse signaling pathways in neurons. In addition, inhibition of ROCK causes several biological events such as increase of neurite outgrowth, axonal regeneration, and activation of prosurvival Akt. Thus, it has attracted scientist’s strong attentions and considered ROCK as a promising therapeutic target for the treatment of neurodegenerative disorders including Alzheimer disease, Parkinson’s disease, Huntington's disease, multiple sclerosis, and amyotrophic lateral sclerosis. However, ROCK has two highly homologous isoforms, ROCK1 and ROCK2. 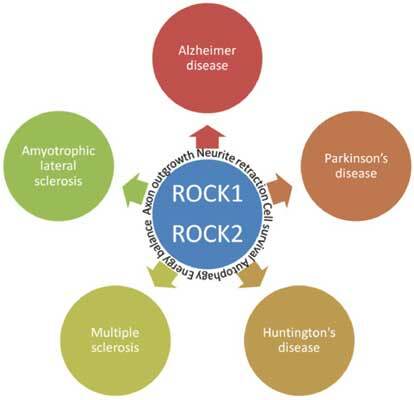 Accumulated evidences indicate that ROCK1 and ROCK2 might involve in distinct cellular functions in central nervous system (CNS) and neurodegenerative processes. This review summarizes recent updates regarding ROCK isoformspecific functions in CNS and the progress of ROCK inhibitors in preclinical studies for neurodegenerative diseases. Axonal regeneration, central nervous system, fasudil, isoforms, LIMK, neurodegenerative diseases, rock.